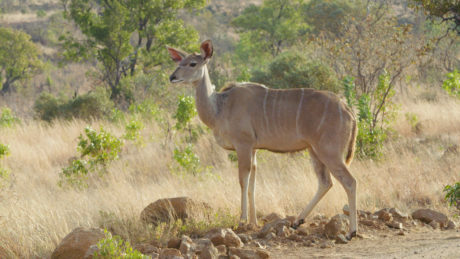 When Kevin Lesser, marketing communications manager, Sub-Saharan Africa, is not in the office, he spends his free time as a qualified trails guide — caring for wildlife parks and the animals that live in them and educating the younger generation on nature and the importance of preserving its beauty. Ten meters. About 33 feet. A world-class sprinter can cover the distance in about one second. An adult lion can in less than half that time. That last fact is significant because it’s how much time one particular John Deere employee may have to make a decision that will affect 10 lives, including his own. When he was young, his parents managed a cattle ranch belonging to Sir John Hewitt in Kenya. So, when Hewitt decided to stop farming and return to Britain, Lesser’s father took his family south to a larger ranch. Lesser was 18 years old when his father died in an auto accident. The family moved to the city, and Lesser, rather than following in his father’s footsteps, studied electrical engineering in university. For the next decade or so, he worked in the electronics development trade. Then he spotted something familiar. Then in 2016, a new role, his current role, brought him back to South Africa. 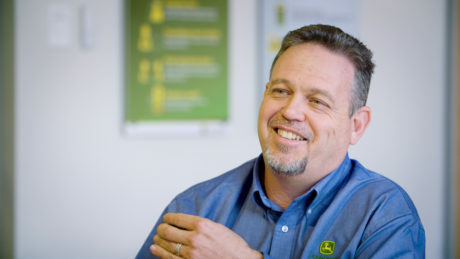 As a marketing communications manager, Lesser works with a group of about 120 employees across Deere locations not just in South Africa, but also to the north in Kenya and Ghana. By his own count, Lesser juggles a dozen different roles, which means no two days are the same, and he has to be ready to adapt to new demands each time he comes to the office. “When you’re in a smaller branch like ours, you have a multitude of functional areas,” Lesser said. “I’m a marketing communications manager, but I’m also the brand ambassador for John Deere in sub-Saharan Africa, so I look out for any intellectual property infringements. I’m the global connection for brand licensing, making sure that the licensing is applied and done correctly here. Event management. Advertising. Website. Social Media. Sales Manual Site.” The list of ad hoc responsibilities goes on, and so does the list of obstacles — language barriers, currency fluctuations, political challenges. And there are day-to-day challenges many employees never face. “Given the large amount of traveling we do, particularly in remote areas, we’re eating strange foods, sleeping in strange places,” Lesser said. “Africa’s quite well-known for its plethora of strange and odd diseases. Malaria. Cholera. Hepatitis. These are things that you commonly encounter”(in Africa). Staying at his best for such a challenging and sometimes daunting role requires Lesser to regularly “recharge his batteries.” He does this not by relaxing poolside or on the golf course, but by taking on an even more challenging and daunting role — safely guiding tourists among some of the world’s most dangerous wild animals. During his own youth, Lesser saw many lions, leopards, wild dogs, and other predatory animals walking around on the farm where his father worked, so he was comfortable around South Africa’s wilder wildlife. Around 2005, Lesser said he found himself missing the wide-open spaces and the wild animals he’d seen growing up. He enrolled in a year-long environmental course — covering geology, grasses, trees, insects, birds, animal behavior, tracking, and guiding — that led him more or less directly to his work as a volunteer field guide in South African parks. Once he finished the qualifications for trail guide, which include training in animal behavior as well as firearms, he could begin guiding tourists through places like Pilanesberg National Park, which is about 133 miles from his home. A tour group is never larger than 10 — eight tourists and two guides. In that “different scenario,” the animal becomes aggressive, and that’s where the calculations from the beginning of this article become important. The guides have rules of engagement. For example, Lesser said, based on their animal behavior studies, they typically give lions the benefit of the doubt up to 10 meters. Once a lion approaches within 10 meters, “it’s not going to stop anymore, and that’s when you have to take the decision to use your rifle,” Lesser said. An adult lion can jump a little over 10 meters, so Lesser has to be good with both decisions and a rifle. At the national parks’ request, Lesser also conducts foot patrols in various sections of those national parks without visitors. Guides walk the parks to help prevent or catch rhino poachers. “I spent many, many of my weekends walking through parks to follow up on poachers’ activities and removing hundreds of snares from the bush,” Lesser recalled. 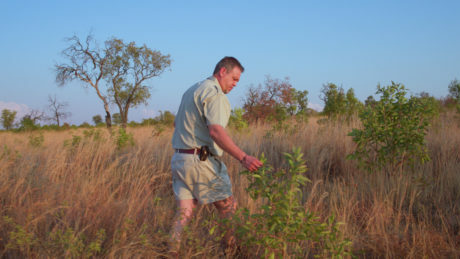 In addition to watching for poaching, Lesser says he looks for broken fences, invasive alien plant species, and the condition of the veld and the animals. A big task considering that one of those parks, Kruger National Park, is about the size of the nation of Israel. 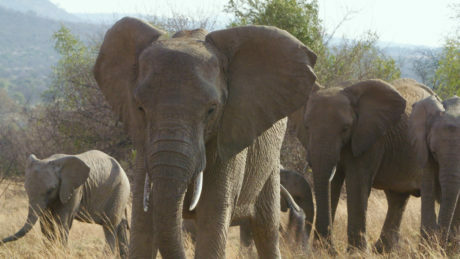 The point of decision with elephants is further — up to 30 meters. Elephants can’t jump, of course, but they weigh between four and six tons, and a charging elephant will take a significant distance to bring it down because of its momentum. Lesser once was guiding a group and halted about 35 meters away from a pair of white rhinos. 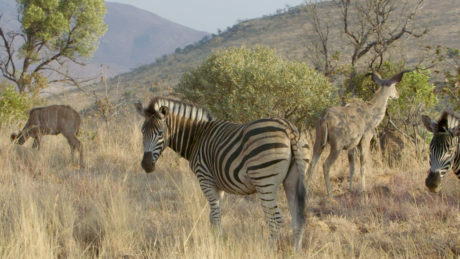 “We were sitting underneath a bush watching them,” recounted Lesser, “when a pair of warthogs came up out of the bush. And as they trotted along, they ran into the rhinos by accident and completely disturbed them. The rhinos got up and ran in all directions. Our party was covered just by a bush. One rhino went to the right of us and the other went to the left. That happens.” An adult rhino weighs about 1,500 pounds, so the difference between running around a bush instead of through it is significant. If they don’t run, what do they do? Another time, Lesser was in a vehicle with a tour of high school students from New Zealand when a young bull elephant came up and rested one of his tusks on Lesser’s armrest. Because young bulls are less predictable than older male elephants, Lesser was concerned it might do something rash. Reassuring the group and remaining absolutely calm and immobile saved the day.